A beautifully rendered story of two young high-school seniors in a rural countryside of Hokkaido. This is a love story of how their love for each other transcends and evolves to something infinitely deeper and binding. Shuuji and Chise - find themselves caught amidst a war of destruction that needs to be fought. 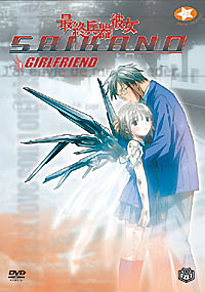 Shuji one day discovers that his girlfriend has been turned into "The Ultimate Weapon," an engineered weapon capable of destroying entire cities. Discover how Chise and Shuji, divert their focus of war, destruction, and killing, into love and strength. Contains 4 episodes and a bonus Extras Disc! DVD Features: Conversation with Voice actors (Shuji & Chise), Creditless Opening theme & Ending theme, TV special "All About SAIKANO," Talk Show "Family Explores" with Voice Actors (Chise,Shuji & Tetsu), Short TV Program "SAIKANO Times," TV commercials, Line art, and Color character sheet.